Kevin Durant was so focused on one of his old teammates in Golden State's 121-100 thumping of the Thunder that he completely forgot about one of his current Warriors teammates. 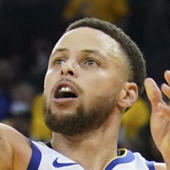 Wanting to say something to his one-time friend and now ex-teammate Russell Westbrook, Durant zoomed in on the Thunder guard and failed to notice Stephen Curry wanting to give him a high-five. In an effort to avoid the embarrassment getting left hanging, Curry simply and hilariously high-fived himself. No matter the situation, Steph is always going to be Steph.